You know how important fiber is to your clients’ health. It can help them maintain proper digestion and elimination, lower blood cholesterol levels, stabilize blood glucose, and even lose weight. Yet only 5% of Americans are meeting the daily recommendations. 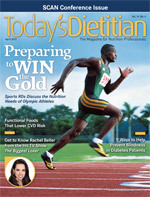 In this article, Today’s Dietitian will give you the tools to help your clients fill in their fiber gaps. It’s a simple fact that people aren’t eating enough whole grains, legumes, fruits, or vegetables—the main sources of dietary fiber. So it shouldn’t be surprising that the average intake of dietary fiber is pitifully low—only 15 g per day on average. In fact, dietary fiber is listed as a “nutrient of concern” in the 2010 Dietary Guidelines for Americans—along with potassium, calcium, and vitamin D—because intake is low enough to be a public health concern. The Adequate Intake for fiber is 14 g/1,000 kcal—25 g per day for women and 38 g per day for men, according to the 2010 Dietary Guidelines. “Today’s rapid pace and lifestyle hinders people from getting enough fiber. They eat quick pantry food items when they’re hungry, such as chips and crackers, instead of carrots,” says Jessica Crandall, RD, CDE, a national spokesperson for the Academy of Nutrition and Dietetics (the Academy) and a dietitian at Sodexo Wellness and Nutrition. “People don’t pick high-fiber foods. The highest sources of fiber are first whole grains; second, legumes; third, vegetables; and fourth, fruits. People may think, ‘I ate an apple or some lettuce, so I got my fiber.’ But that doesn’t get the job done,” explains Joanne Slavin, PhD, RD, a professor in the department of food science and nutrition at the University of Minnesota who served on the Dietary Guidelines Advisory Committee. Fiber, a nondigestible form of carbohydrates that occurs naturally in plant foods, may protect health in many important ways. The 2010 Dietary Guidelines highlight the significance of meeting dietary fiber goals because the scientific evidence shows health protective benefits include promoting a feeling of fullness and healthful laxation. In addition, dietary fiber that occurs naturally in foods also may help to reduce the risk of cardiovascular disease, obesity, and type 2 diabetes, according to the 2010 Dietary Guidelines. Yet the public doesn’t fully comprehend all they have to gain by boosting their fiber intake. “The biggest impact fiber can have on people’s health is preventing constipation and promoting gut health. This is important for kids; I frequently hear people say that their children have constipation. Digestion and absorption are really important, and it’s much easier to prevent constipation than it is to treat it,” Slavin says. It’s important to remind people that fiber benefits extend beyond healthful digestion. “Most people think of fiber as helping to promote digestion and bowel regularity. People aren’t getting enough information on other fiber benefits, such as satiety and obesity prevention, as well as keeping cholesterol levels in check and stabilizing blood sugar. These three areas are undereducated and underemphasized,” Crandall says. Considering the health fallout of the obesity epidemic, it’s important to stress fiber’s role in satiety and weight loss. “The data on fiber and obesity is pretty good; people who eat more high-fiber foods tend to weigh less,” Slavin says. There are many kinds of fiber associated with health benefits. Soluble fiber, which is linked to lowering cholesterol levels, is found in foods such as legumes, oats, barley, nuts, and some fruits and vegetables. Insoluble fiber, found in whole grains, wheat bran, nuts, seeds, and some fruits and vegetables, acts like a sponge, passing through the intestines mostly unchanged, thus helping promote good bowel motility. Nondigestible oligosaccharides found in some fruits, vegetables, seeds, and grains resist digestion and act as a prebiotic to promote gut health. Resistant starches, found in unripe bananas and potatoes, also may help increase energy expenditure and lower glucose levels. Inulin, which is often added to foods as a functional ingredient, isn’t digested in the upper gastrointestinal tract and stimulates the growth of friendly gut bacteria. So which fibers should you promote to your patients? “Having fibers from a variety of sources is ideal,” Slavin stresses. That’s where the beauty of a diet rich in a variety of plant foods comes in. The health advantages of consuming food products filled with added isolated fibers, such as inulin or bran, are under debate. The National Institutes of Health reported in August 2010 that the health benefits of added isolated fibers are still unclear. Research suggests they may not have the same effects as the intact fibers found in whole foods. There's little evidence that isolated fibers help lower blood cholesterol, and they have differing effects on regularity, though studies suggest that inulin might boost the growth of good bacteria in the colon. 1. Break down the barriers. “Beans make me gassy; fiber makes me bloated.” Such are the common objections you’ll encounter among people when you’re trying to boost their fiber intake. Crandall says, “People may be hesitant to increase fiber because of [these] concerns, so you need to break down the education to help people take the next step.” It may be important to discuss the basics on how fiber works in the digestive tract in order to get through to your patients. 2. Cut through the confusion. Fiber can be a puzzling concept. RDs tell clients to eat more plant foods to increase fiber, but when it comes to fiber, all plant foods aren’t created equal. Clients may think they’re doing fine in the fiber department, but if they’re not choosing high-fiber plant foods such as whole grains and legumes, they could be getting minimal intake. “People are confused,” Crandall says. “They think that a salad every night gives them a lot of fiber, but it may only provide 2 or 3 g, and they need to get more.” Telling clients specifically which whole grains and legumes to eat will help clear up any confusion. 3. Don’t underestimate challenges. As dietitians, it’s easy to say that meeting fiber goals is a breeze. But when was the last time we as RDs took our own 24-hour food recall and analyzed it for fiber intake? Getting 25 g to 38 g of fiber a day can be tough for anyone. Dietary restrictions, such as weight loss diets with lower carbohydrate recommendations, can make getting enough fiber even more difficult. “Meeting fiber needs isn’t as simple as we think it is. We need to help people by offering them lots of solutions,” says Slavin, who suggests that fiber-enriched foods may be one way to add needed grams to their diet. 4. Demystify whole grains. Whole grains are one of the best sources of fiber, but “the whole grain message is confusing,” Slavin says. “There are many new whole grain food products that are really low in fiber. Foods such as cookies and breakfast cereals may say they have whole grains in them, but they can be low in fiber.” So educate your patients on methods for identifying whole grains, such as looking for the Whole Grains Council’s Whole Grain Stamp on food labels that indicates they’re a good source of whole grains. 5. Make it practical. Move beyond a lecture on how good fiber is for the body. Tell patients how they can incorporate fiber into their diets. “People need practical tips on how to eat more high-fiber foods, such as pulling out a vegetable tray from the refrigerator, how to look for whole grains, examples of using beans on salads, and which fruits, such as berries, are high in fiber,” Crandall says. 6. Keep it simple. As much as RDs want clients to eat a minimally processed, whole-foods diet that’s naturally rich in fiber, it’s just not going to happen for many of them. It’s an RD’s job to meet clients where they are and give them simple methods that will work, whether it’s finding the perfect breakfast cereal the whole family will like or suggesting portable high-fiber snacks such as snap peas or bananas, Crandall says. 7. Be specific. Instead of general recommendations, Crandall suggests RDs give patients specific suggestions—down to the actual brand of foods or type of whole grain or fruit—they should eat every day. “For example, tell them to have oatmeal for breakfast, add bell peppers and mushrooms to scrambled eggs, or have berries with yogurt,” Crandall says. 8. Suggest fiber extras. Offer tips for regularly increasing fiber every day through the addition of “extras,” such as 1 oz of flaxseed sprinkled on foods for an extra 8 g of fiber or a high-fiber granola bar providing 5 g of fiber as a routine snack. Your patients have much to gain by achieving their fiber goals. To meet their fiber challenge head on, equip them with the skills they need to boost their intake, starting with basic education on digestion and moving up to identifying fiber sources in food products. Consider suggesting fiber supplements to clients to help them meet their daily fiber goals as well as to control bowel irregularity, reduce appetite, and lower blood sugar and cholesterol levels. “Fiber supplements have their place for helping certain people meet their requirements. Some patients may find vegetables unpalatable because of texture aversions, or you may encounter bariatric or diabetic patients with limited carbohydrate intake who may have a difficult time meeting their fiber goals,” says Jessica Crandall, RD, CDE, who provided information for the following table. Fiber supplements, available in powder, tablet, capsule, or water, contain differing amounts of soluble fiber per dose. The general recommendation is a maximum of 10 g of fiber per day from a fiber supplement, Crandall says. Dosages should be evenly dispersed throughout the day, with no more than 3 to 5 g taken per serving. Patients should start fiber supplements in small doses at first, with plenty of water, and work their way up to the recommended dose. 1. Cover the beans with three inches of cold water in a heavy saucepan; bring to a boil, then immediately remove from heat. Cover and let sit 1 hour, then drain and rinse the beans. 2. Heat 1 T of the olive oil in a large, heavy saucepan or Dutch oven over medium-low heat. Add the pancetta. Cook until crisp, about 5 minutes. Stir in the onion and cook until softened, 5 to 10 minutes. Add the garlic and cook a few more minutes, stirring frequently to prevent browning. 3. Add another tablespoon of the olive oil, then stir in the celery and carrots and cook 5 minutes. Add the remaining tablespoon of olive oil and stir in the beans, barley, triticale, and sage. Stir well to combine and thoroughly coat the grains with the oil. Add 2 cups water and 4 cups stock, bring to a boil, then reduce heat and simmer, partially covered, until the beans and grains are tender, 1 to 11/2 hours. 4. Transfer 1 cup of the soup to a food processor, let cool slightly, then purée until smooth. Stir the purée back into the soup, add the remaining 2 cups stock, and bring to a simmer. Season to taste with salt and pepper. Serve sprinkled with parsley. 1. Mix beans, quinoa, corn, bell pepper, mango, onion, cilantro, and jalapeño together in a mixing bowl. 2. Whisk lemon juice, olive oil, garlic, cumin, chili powder, and turmeric in a small bowl. Toss into the salad mixture and chill salad until serving time.